Walking and serious Landscape Photography - an Oxymoron ? 'Oil' is Burtynsky's masterpiece - it's the project that has brought him to the attention of the world and has captured the flavour of 'peak oil'. The work takes the aesthetics from his previous projects and applies them to a topic close to his heart, a topic discovered during an epiphany where he took a detour on a trip out to discover classic wild landscape photographs and instead discovered the altered landscape - and the biggest alterations of our planet have come about through the use of oil. Burtynsky uses his formal compositions and ability to find the beauty in almost anything to draw our eye in to an image, drawing us in until we start to really see his chosen subject. Many argue that aestheticising destruction is wrong in some way, I'm not sure how this is argument works though - desecration isn't inherently ugly, it's the thing itself that is 'ugly' and the representation of something is just a way of seeing. 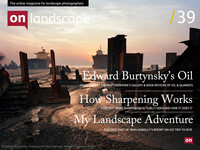 Although Burtynsky doesn't like to talk about the politics of his subject matter, the essays included in the book manage to make the politics fairly obvious. The discussion of the rise and decline of the oil industry is erudite and ultimately quite depressing. It's this tension between beautiful representations and difficult topics that makes the book successful on many different levels. For me, the most successful pictures are the where this dichotomy is at it's strongest. Oil pipes through pristine woodland; Arrayed derricks on remote desert; The landscape and topology of a tyre wasteland; and finally, the awesome Bangladeshi ship breakers. If you just want the aesthetic landscape, start with Quarries, if you want an overview of Burtynsky's work, start with Manufactured Landscapes and if you want to see what one of the most successful photography projects in history looks like, get Oil. An epic undertaking, Burtyksky's Oil covers the whole process from extraction, through processing and use to the disposal of it's raw materials. You can buy the book from Beyond Words by clicking here.